As Cannabidiol [CBD] continues to explode in popularity more and more people are availing of its seemingly endless health benefits. We have already looked at what CBD is and how it works in our previous blog, but how do you use CBD? These days there are a multitude of different options for consuming it. You can inhale it, add it to your food, swallow it and take it as oil under your tongue; you can even rub it directly onto your skin. However as the body absorbs CBD in different ways, how you choose to consume it will influence the effect it has on you and determine how long it will take to work. This can make discovering your optimal route of administration pivotal in your CBD experience. 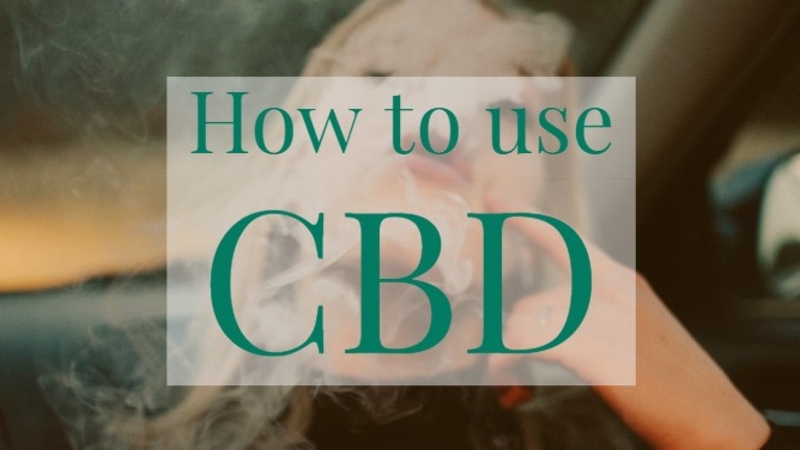 Below is your guide to using CBD. For CBD to take effect, your body must first absorb it into the bloodstream from which it can travel around the body and interact with cannabinoid receptors; how it does this will hinge on the selected route of administration. The route of administration can greatly affect the uptake, distribution and even elimination of the CBD molecule in your body rendering it key in determining the efficacy of the CBD product you are consuming. This is known as ‘bio-availability’ which is defined as “the amount of a substance that enters the bloodstream when introduced into the body and so is able to have an active effective.” Below we explore some of the options to help you decide which administration method is right for you. Inhalation is a very effective method of delivery and preferred by many as the body absorbs it quickly. Effects are almost immediate making it a solid option for people that require fast acting relief. CBD, when inhaled is absorbed through the alveoli in your lungs, which offer a large absorptive surface area. From there it enters your bloodstream and is rapidly distributed throughout the body. There are many products to choose from if wishing to inhale CBD, the most popular of which is e-liquid however many also smoke industrial hemp bud with legal amounts of THC. You can also find highly potent wax crumble and terpene infused crystal for dabbing. CBD oral consumption methods include edibles, capsules and even beverages. While oral consumption offers certain benefits, any consumed substance will pass through our digestive and metabolic systems before entering the bloodstream which can drastically reduce CBD’s bio-availability and increase the time taken to take effect. Studies have found that consuming CBD oil with fatty acids can help bypass first pass metabolism in the liver increasing how much CBD is absorbed through ingestion. This explains why many CBD capsules will have some form of carrier oil, usually MCT, along with your plant extract to maximise uptake. The most common route of CBD administration is sublingually. CBD oil is typically taken orally via dropper or spray, specifically under the tongue where it is absorbed by the mucus membranes. For best results the oil should be held under the tongue for upwards of 90 seconds prior to swallowing. This sublingual technique allows CBD to bypass the digestive system and liver metabolism so the compounds can elude being broken down by enzymes and reach the bloodstream faster. When spreading CBD oil or balm on your skin it will never reach the bloodstream. It can however provide targeted relief to a particular area by interaction with the cannabinoid receptors close by. Human skin is not very permeable in general however and will prevent the majority of substances from entering the bloodstream. Absorption rates are also relatively low therefore the product must be applied generously enough to break the skin barrier. The main advantage to this method is you can target a specific area and introduce cannabinoids directly to it. In order to get the most out of your topical CBD it is advisable to utilise one with a high CBD content. The CBD molecule itself is hydrophobic which means it will not mix with water. It is oil soluble hence the requirement for carrier oil in tinctures, etc. Over the past few years however, new advances in technology have enabled the development of water soluble CBD. To create these products CBD and its accompanying cannabis molecules are emulsified (broken into tiny particles) or carried by a hydrophilic (water-friendly) carrier. These forms require the use of a surfactant which eases the surface tension between the oil and liquid. One popular method is the use of Liposomes. Liposomes are water-containing spherical structures made of an internal water-friendly compartment surrounded by a water-insoluble bi-layer. CBD extract can be stowed in the bi-layer membrane. These products are rapidly absorbed into the body and boast a much quicker onset time. They are also highly bio-available which means you can achieve similar results by taking a lower dose. It is an ideal method for people who do not like the taste of the oil and do not vape. Instead you can add the water soluble to a drink of their choice and enjoy. It is clear from our guide to using CBD that there is no one size fits all solution. Everyone reacts differently to CBD and will have different requirements. It is simply a matter of experimenting with dosage and administration to establish what best fits your needs. To find out more about Cannabidiol or to speak to someone about how you can incorporate CBD into your diet? Contact us through the website or on social media and one of our dedicated CBD experts will be more than happy to assist.